These condoms are quite unique and definitely not your average condom. There is a different feeling for the woman and the man. It's not one labeled for his pleasure or for her pleasure. These condoms aim to feel special and please both parties. As a female, I loved the feeling I received on my end. However, my partner was not happy at all and he refuses to use them again. So lets start of with the name of these condoms. I am very creative and just love the idea of trying new things. 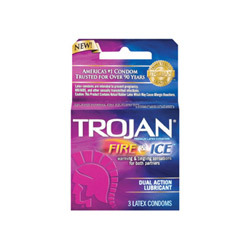 Just hearing the name fire and ice had me thinking that I was going to be in for a good time, just like the Trojan commercials promote. Now I cant give the perspective of every man, but I can give the perspective from my man. When I brought these home, he just looked at me and said "Why did you buy these?" Apparently feeling something really cold and then really hot just did not sound like a good time to him. We are quite opposite, so I bought the smaller pack to give it a try. I'm a woman, so of course I won the battle and we got to use the treat I came home with, Fire and Ice Condoms. Now neither of us had ever tried anything like them before. At first, we couldn't tell the difference. Then I noticed a coolness followed by a tingle. Now this was a good tingle. I describe it as the tingly feeling a woman gets right before climax, the one you try to hold onto right before reaching that point. I thought it felt great. My mood was killed by him saying it just feels a little weird. I cant really say I felt any heat from it, I just really felt the coolness and the tingle. I would compare it to the feeling of Icy Hot or Vick's Vapor Rub. At the conclusion of our fire and ice, he finally stops complaining when he is getting close to climax. So as he begins to get into to it and as he is climaxing, he stopped and just started back to his complaining and said, this isn't right. He felt the fire part right when he climaxed. I felt more intense cooling which was great for me, but my fun was interrupted with his complaining. So my conclusion of my review is that this is something that is not just for everybody. You need to make sure both parties are willing to experience a new feeling. It will catch you off guard if you don't know what to expect. I still like them, but I cant get him to use them again. Make sure you have a partner who wants to honestly try this or else you may have to deal with a complainer like I had to. Thanks for reviewing! These seem soooo uncomfortable to me.